✅ 2 YEAR WORRY FREE WARRANTY - Our dog training collar comes with 2 year manufacturers replacement warranty and a 30 Day Money Back Guarantee. DOG TRAINING FAST - Stop Barking, Mounting, Jumping up, Leash Pull and get Fast Recall and Control around Kids, Other Dogs and People. These collars work fast. ✅ 3 x SAFE, EFFECTIVE and EFFICIENT MODES of OPERATION - Our dog training collars assist with identifying your dog\'s most suitable response level for efficient and effective dog training. In addition to the standard Beep/Tone Mode, Dog training collar can be customized from 1-8 levels of Vibration and 1-16 levels of Shock Stimulation with conductive silicone covers to ensure safe and comfortable contact against your dog\'s skin. The collar is adjustable up to 27\" in length. ✅ RECHARGEABLE, WATERPROOF and LONG RANGE - This premium shock collar for dogs is designed for a flexible training program with remote operation up to 1000ft. The IPX7 Waterproof dog collar recharges in 2 hours providing up to 15 days standby. This allows you to train your dog for extended periods outside the confines of your home and provides the confidence in knowing the dog training collar will continue to operate effectively if your dog plays in the rain or decides to take a swim. ✅ DURABLE, MULTI FUNCTION and USER FRIENDLY - The dog training collar with remote are both made from ABS to provide long term durability. The remote handset provides for blind operation with anti-stick buttons and dual channel capability to simultaneously train 2 dogs at the same time. The USB charging cable also allows for both the remote and receiver to be charged at the same time enabling you to continue training with minimal delay. 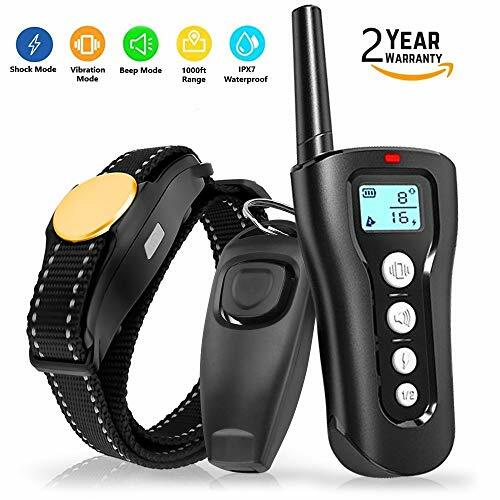 ✅ DOG WHISTLE and DOG CLICKER - The 2 in 1 dog training clicker and whistle is the perfect addition that can be incorporated into your training program. In addition to using as part of your training, they can both be utilized as an effective anti bark device and is small enough to attach to your keyring. The 2 in 1 Whistle Clicker provides an additional training aid that can be easily accessible at any time!